Thanksgiving is one of my favorite holidays, hands down. I love all of the classic recipes like mashed potatoes, pumpkin pie, and sweet potato casserole. So, basically, I love carbs. My plate at Thanksgiving is always so heavy that I can barely get through more the first round! Salad is great, yes, but after seeing some creative recipes for a fall coleslaw around, I wanted to try and create my own variation that’s also paleo, AIP, and whole 30. 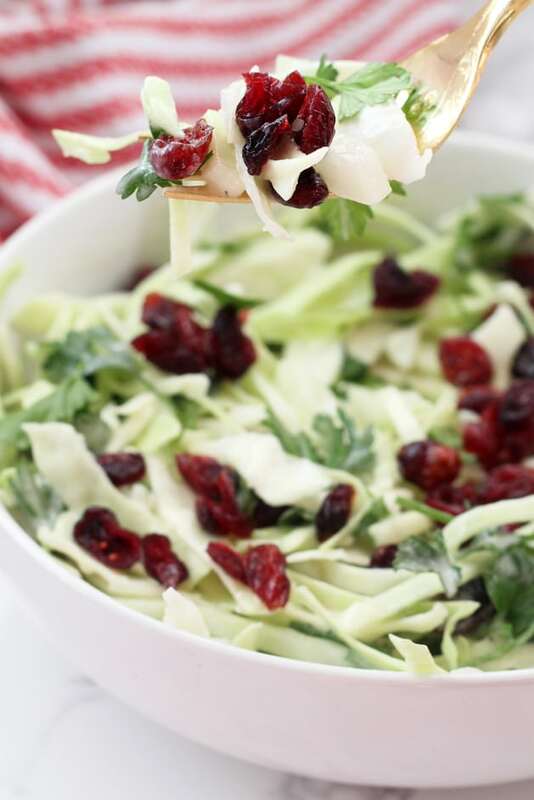 This Thanksgiving Coleslaw is the answer to a having a light, fresh, but still seasonal dish for the holidays! Even the colors of this dish are holiday themed! It’s really easy to make, really hard to stop eating, and I’m sure it will become one of your new holiday favorites. I recommend getting whole cabbage and slicing in at home for the best finished product, however, you can take a shortcut with pre-cut slaw. Green apples sliced into match sticks give this dish a little more crunch and some extra tartness. Make sure you double check the ingredients to get unsweetened cranberries. You can also dry your own at home. Lots of fresh parsley helps round out the flavor and freshness of the dish! You’ll need olive oil (you can also use avocado oil), apple cider vinegar (you can try and sub lemon as well), honey (you can omit this), onion, and coconut cream. The coconut cream is arguably what makes this slaw so addictive. It’s a dairy free alternative to something like mayo or sour cream, and it’s just as good! For the dressing, whisk together the olive oil and apple cider vinegar. Next, add the honey, coconut cream, salt, pepper, and onion and stir to combine. This is the perfect Holiday side dish to add to your regular spread! It’s fresh, light, crunchy and an awesome way to mix up the same old side dishes. It’s always a great dish to have on hand for dinner or lunch during the holiday season! Or even when you’re just craving something holiday themed 😉 It makes tons of servings and lasts for a couple of days in the fridge. Where do you find AIP compliant dried cranberries? I have looked for this at many stores with no luck. Thanks! I don’t have coconut cream on hand. Would it work to sub with coconut cream from the top of a can of coconut milk that I have refrigerated? It should! I used the cream from the top of my home made coconut milk. Seems fine! I agree, it should work! Enjoy!! Everyone around our table love the slaw!!! Thanks for the yummy recipe! Just made this! It taste amazing. I absolutely love it!